As I write blogs I am constantly aware that readers will be wondering where they fit in the scheme of things I am writing about. For that reason I believe it is important for me to point out where I am coming from socially and geographically, as well as a host of other ‘differences’ among all of us. As a white, heterosexual, married, older Canadian woman, living in a city on the east coast, it is difficult for me to place myself in the lives of gay/ lesbian/bi/trans/queer people, men, the street person (homeless), people of colour, those who live in war torn countries or countries where I do not understand the culture or ethnic differences and backgrounds. Even the experience of living in an urban instead of a rural area creates differences that are unique. I also cannot speak to the vast ways in which our Canadian health care system differs from that of our next door neighbors, the Americans, so how could I understand what it would be like accessing health care in Saudi Arabia or any parts of Africa, or Australia? Canada is the second largest country in the world. How can I compare where I live to smaller countries, or even to Russia which is the first largest country? The ways in which I express myself differs from many others too, even those who also use the English language, note for example, how we Canadians spell the word labour or colour. When I speak of temperatures I say that today it is 17C and my American relatives and friends have to translate that to what it means to them…. is that 50F or 80F, they wonder? The reverse is also true of those of us in Canada. The last few years before I retired I was involved in research projects about the health of primarily rural, African Nova Scotian women (please note that there are two views in Canada about whether or not the term ‘African Canadian’ or ‘Black’ is preferable terminology; also the picture shown here is the logo we used, designed by one of our Black women researchers) . What we had in common was we were women; but we had many differences as well…race, economics and living in rural versus urban areas. I had also done a smaller research project about the history of Black nurses and what we had in common was age, gender, and we were all nurses. Finally, this project is about fibromyalgia and there are several African Nova Scotian women’s stories in the book (along with White women’s stories). 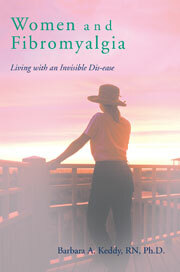 What we all had in common was that we were women and we all suffered from fibromyalgia. What I had never experienced was racism. Therein was a great difference in our experiences. I have though experienced sexism and ageism. I have also been very economically disadvantaged, but never homeless. All women have had covert or overt experiences of sexism. Everyone who lives to become an older person will experience some degree of ageism, even though it may be subtle. Unless we are lesbian or gay we have never experienced homophobia. I cannot then write about all of us with fibromyalgia as if we were universal human beings with similar life stories. So, while I think it is important to point out that we may live under circumstances that are unique to each of us…race, gender, social class, education, geography, age, sexual orientation, abilities, we do have this one unifying struggle. We know what it is like to wake up each day to pain and fatigue, not to mention other challenges that go with this dis-ease. Therefore, I ask of you to be tolerant of me if I write as though I can ever know about your daily challenges. I can only know that we do have one thing in common, that demon, fibromyalgia that lives with us and won’t let go! This entry was posted in ageism, black women and fibromyalgia, cultural differences, Fibromyalgia, geography and fibromyalgia, health care systems, homophobia, race and fibromyalgia, racism and fibromyalgia, sexual orientation, social class and fibromyalgia, urban vs. rural on June 2, 2008 by Barbara Keddy. Great Post! The number two thing we all have in common: We are all human.